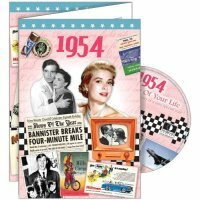 1954 A Time to Remember Greetings Card and 20 track CD. 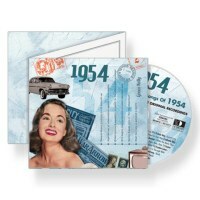 Perhaps the most unusual and treasured gifts around - 20 Original hits from the year 1954, presented on a CD and mounted in a quality 3-part, gate-fold, GiftCard, complete with envelope (GiftCard, CD, and white envelope, are all sent in a protective outer). 1. Rosemary Clooney - Mambo Italiano. 2. Frankie Laine - Blowing Wild. 3. Doris Day - Secret Love. 4. Glenn Miller - Moonlight Serenade. 5. Elvis Presley - I'll Never Stand In Your Way. 6. Johnnie Ray - Such A Night. 7. Harry Belafonte - I'm Just A Country Boy. 8. Tony Bennett - While The Music Plays On. 9. Fess Parker - Ballad Of Davy Crockett. 10. The Four Lads - Rain, Rain, Rain. 11. Sauter Finegan Orchestra - The Loop. 12. Perry Como - Papa Loves Mambo. 13. Frankie Laine - My Friend. 14. Guy Mitchell - Cuff Of My Shirt. 15. Chet Baker - I'm Through With Love. 16. Rosemary Clooney - This Ole House. 17. Louis Armstrong - Beale Street Blues. 18. Percy Faith - Baubles, Bangles And Beads. 19. Doris Day - If I Give My Heart To You. 20. Duke Ellington - Skin Deep.